Sakai Guides and DocumentationSakai Complete User Guide ResourcesHow do I notify site participants that content has been added to Resources? Site owners can automatically notify participants via the Notifications feature that an item has been added to Resources. When used, site members receive an email containing details of the file or link that has been added to Resources. When adding an item, select High or Low notification. When uploading a file, creating a web link, creating a text file, creating an HTML page or creating a citation, the Email Notification dialog box is displayed before confirming file creation. 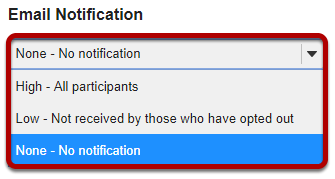 Selecting "Low" will result in an email being sent to only those participants that have not opted out of "Low" level notifications in their workspace Preferences. Prev: How do I add and display contextual information about a file or folder? Next: How do I obtain the URL for a file or folder in Resources?